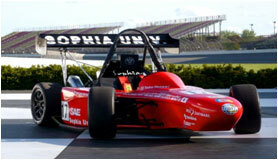 The University of Sophia, in Tokyo has a racing team that participates in Formula-SAE which is a racing competition for students. Through that, we get to learn the essence and the process of manufacturing, and also aim to create an environment where we can feel the severity and joy of manufacturing and team management. We aim to learn talents that will apply in real world applications. The Team Structure of Sophia Racing is divided into two sections; the technical team which designs and builds the car, and the management team which manages on various levels. The chassis team which specializes on the framework and underbody of the car. The powertrain team which designs the sections around the engine. 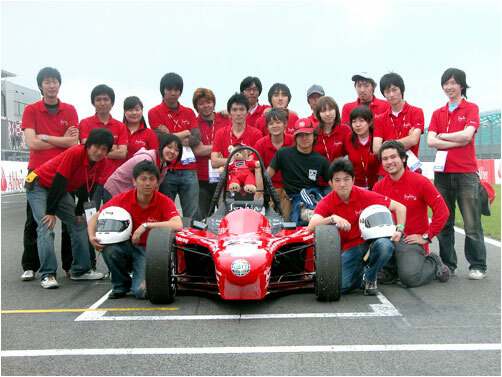 The Aero Dynamics team which specializes on the car design and appearance. Each of team has a team leader and a project leader who controls the whole team. Using the YAMAHA YZF-R6 Engine for a motorbike, the powertrain team aims for high rotation and high power, by developing induction/exhaust system, cooling system, lubricating system, and fuel system, and also by developing simulation software to design each part. The Chassis team is in charge of frame design , underbody design such as suspension geometry, design of the pedal unit break system and steering and shift unit. This team is also in charge of the development of the drive simulation program. The Aero Dynamics Team builds the cowl, which is the most important part of the car when it comes to appearance. In order to design the car, we use Pro/Engineer which visualizes the cowl design in 3D, and therefore enables us to design as we like, even for the sections that would be difficult to design in 2D. Unlike the other teams the management team does jobs such as team management, working with the sponsors, joint research with corporations and generates activity reports on the web for the actual corporations to look at. The management team also records and takes care of the activities done by the other teams, by holding weekly team meetings in order to make it easier for the team members to do their activities. The management team also records the data of each part such as the manufacturing cost and weight, this makes things easier for the technical teams to share information and to help shorten the manufacturing time. Adams was used to simulate the movement of the vehicle and forces that apply to frame and suspension parts. There were mainly two aims on this simulation. The first one was to calculate the dynamic boundary condition of parts for FEM analysis, and the second was to know the dynamic effect of suspension parameters such as spring and stabilizer rate, and damping rate. This year by conducting simulation mainly focusing on skid pad, frame pivot point and lateral force was calculated for setting the dynamic boundary conditions of FEM analysis of each part. In addition, we are considering using the design parameters as an index for setting up the vehicle.